“ISO/IEC 17025 is the main standard used by testing and calibration laboratories. Originally known as ISO/IEC Guide 25, ISO/IEC 17025 was initially issued by the International Organization for Standardization in 1999. There are many commonalities with the ISO 9000 standard, but ISO/IEC 17025 adds in the concept of competence to the equation. And it applies directly to those organizations that produce testing and calibration results. Since its initial release, a second release was made in 2005 after it was agreed that it needed to have its quality system words more closely aligned with the 2000 version of ISO 9001.The standard was first published in 2001 and on 12 May 2005 the alignment work of the ISO committee responsible for it was completed with the issuance of the revised standard. The most significant changes introduced greater emphasis on the responsibilities of senior management, and explicit requirements for continual improvement of the management system itself, and particularly, communication with the customer. Click here for the full entry. Who is ISO/IEC 17025 for? ISO/IEC 17025 is useful for any organization that performs testing, sampling or calibration and wants reliable results. This includes all types of laboratories, whether they be owned and operated by government, industry or, in fact, any other organization. The standard is also useful to universities, research centers, governments, regulators, inspection bodies, product certification organizations and other conformity assessment bodies with the need to do testing, sampling or calibration. Why has ISO/IEC 17025 been revised? The last version of ISO/IEC 17025 was published in 2005 and, since then, market conditions and technology have changed. The new version covers technical changes, vocabulary and developments in IT techniques. It also takes into consideration the latest version of ISO 9001. What does ISO/IEC 17025 mean to me? What is the difference between a Standard Cal and an ISO/IEC 17025 Accredited Cal? There are three types of calibrations services we offer: Standard Calibration, Calibration with Data (z540), and Accredited Calibration (17025) and Customer Specific Calibrations. Standard calibration is just that. We calibrate the unit to OEM specifications and performance test it to ensure proper functionality. 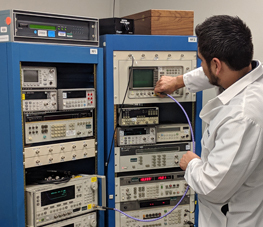 Z540 or calibration with data is the same as a standard calibration except we include all of the calibration data with it when we return it to you. A fully accredited calibration is compliant to all 17025 standards and procedures, includes data as well as a detailed list of all measurement uncertainties. Accredited calibrations are only available on equipment that fall within our scope of accreditation. Every company and project is different – just let us know what you need and we can provide that service. Who were you accredited by? 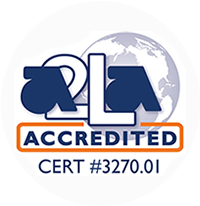 Anko Electronics Test & Measurement is accredited by A2LA (www.a2la.org) or The American Association for Laboratory Accreditation. A2LA is a non-profit entity who provides accreditation and accreditation-related training for testing labs, calibration labs, inspection bodies, proficiency testing providers, medical testing laboratories, reference material producers and product certification bodies. Z540-1-1994 and the requirements of ANSI/NCSLI Z540.3-2006 and R205. What is the scope of your accreditation? Do you have additional questions about ISO/IEC 17025 Accreditation? We are here to help, contact Darren at info@ankocalibration.com with any other accreditation related questions you may have.